Habit: Annual to tree. Leaf: basal and/or cauline, alternate, opposite, rarely whorled, simple to 2+ × compound. Inflorescence: 1° inflorescence a head, resembling a flower, of several types (see below), 1--many in generally +- cyme-like cluster; each head generally with +- calyx-like involucre of 1--many series of phyllaries (involucre bracts); receptacle of head flat to conic or columnar, paleate (bearing paleae = receptacle bracts) or epaleate; flowers 1--many per head. Flower: bisexual, unisexual, or sterile, +- small, of several types (see below); calyx 0 or modified into +- persistent pappus of bristles, scales, and/or awns; corolla radial or bilateral (0), lobes generally (0)3--5; stamens 4--5, filaments generally free, generally fused to corolla at tube/throat junction, anthers generally fused into cylinder around style, anther base generally rounded or cordate (deeply sagittate or with tail-like appendages), tip (= flattened appendage) generally projecting beyond pollen sac; pistil 1, 2-carpeled, ovary inferior, 1-chambered, 1-seeded, placenta basal, style 1, tip generally +- 2-branched (except in some staminate disk flowers), branch tips truncate or generally bearing +- brush-like appendages; stigmas 2, generally on adaxial faces of style branches. Fruit: achene (also called a cypsela) (drupe in Chrysanthemoides), cylindric to ovoid, sometimes compressed, generally deciduous with pappus attached. Genera In Family: +- 1500 genera, 23000 species: worldwide, many habitats. Note: Flower and head types differ in form and sexual condition. A disk flower has a generally radial corolla, with a cylindric tube, expanded throat, and generally 5 lobes. Disk flowers are generally bisexual and fertile but occasionally staminate with reduced ovaries. Discoid heads comprise only disk flowers. A radiant head is a variant of a discoid head, with peripheral disk flower corollas expanded, often bilateral. A ray flower corolla is bilateral, generally with a slender tube and flattened petal-like ray (single lip composed of generally 3 lobes). Ray flowers are generally pistillate or sterile (occasionally lacking styles). Radiate heads have peripheral ray flowers and central disk flowers. Disciform heads superficially resemble discoid heads, with pistillate or sterile flowers that lack rays, together with or separate from disk flowers. A ligulate flower is bisexual, with a bilateral, generally ephemeral corolla and 5-lobed ligule. Liguliflorous heads comprise only ligulate flowers. See glossary p. 31 for illustrations of family characteristics. Echinops sphaerocephalus L., Gaillardia aristata Pursh, Gaillardia pulchella Foug., Hymenothrix loomisii S.F. Blake, Tagetes erecta L., Thelesperma megapotamicum (Spreng.) Kuntze are waifs. Melampodium perfoliatum Kunth, historic urban waif. Ageratum conyzoides L., Guizotia abyssinica (L. f.) Cass., Santolina chamaecyparisus L., orth. var. are rare or uncommon escapes from cultivation. Dyssodia papposa, Ismelia carinata (Schousb.) Sch. Bip. [Chrysanthemum carinatum Schousb. ], Mantisalca salmantica (L.) Briq. & Cavill. are historical or extirpated waifs in California. Inula helenium L. not documented in California. Taxa of Aster in TJM (1993) treated here in Almutaster, Eucephalus, Eurybia, Ionactis, Oreostemma, Sericocarpus, Symphyotrichum; Chamomilla in Matricaria; Bahia in Hymenothrix; Cnicus in Centaurea; Conyza in Erigeron and Laennecia; Dugaldia in Hymenoxys; Erechtites in Senecio; Hymenoclea in Ambrosia; Lembertia in Monolopia; Osteospermum ecklonis in Dimorphotheca; Picris echioides in Helminthotheca; Prionopsis in Grindelia; Raillardiopsis in Anisocarpus and Carlquistia; Schkuhria multiflora in Picradeniopsis; Trimorpha in Erigeron; Venidium in Arctotis; Whitneya in Arnica. Amauriopsis in TJM2 (2012) treated here in Hymenothrix; Arida in Leucosyris; Bahia in Picradeniopsis. Unabridged Note: Largest family of vascular plants in California and of eudicots globally. Scientific Editor: David J. Keil, Bruce G. Baldwin. Habit: Annual, perennial herb, glabrous or hairy. Stem: generally branched, generally erect, < 60 cm. Leaf: opposite (or distal-most alternate), < 20 cm, entire to pinnately cut. Inflorescence: heads radiate (disciform), 1 or in cyme-like cluster; involucre cylindric to obconic, bell-shaped, or hemispheric; phyllaries 4--18 in 1(2) series, free or +- fused; receptacle narrowly conic to hemispheric, smooth, pitted, or rough, epaleate. Ray Flower: 4--16; ray generally yellow (short or 0). Disk Flower: generally many; corolla generally (4)5-lobed, generally yellow to +- orange; anther tip awl-shaped to triangular; style tips triangular or dome-shaped, generally hair-tufted. Fruit: < 5 mm, cylindric to obovoid, black to gray; pappus of awns, scales, or 0. Species In Genus: 18 species: western North America, Chile. Etymology: (Greek: female student of Plato who dressed as a man) Note: Generally self-sterile. Habit: Annual, perennial herb < 40 cm. Stem: erect or decumbent, simple or freely branched, +- hairy. Leaf: 0.8--21 cm, linear to oblanceolate or oblong, +- entire or with 3--5+ teeth, glabrous or +- hairy, +- fleshy in coastal forms. Inflorescence: involucre 5--14 mm, bell-shaped to depressed-hemispheric or hemispheric; phyllaries 4--16 in 1--2 series, free, hairy, persistent or falling with fruits; receptacle conic, rough, glabrous. Ray Flower: 6--16; corolla dark red in alkali solution; ray 5--18 mm. Disk Flower: many; anther tip +- lanceolate to triangular; style tips triangular. Fruit: < 4 mm, linear to narrowly club-shaped, glabrous or hairy, black to gray or silver-gray; pappus of 1--7 clear, brown, linear to awl-like scales, or 0. Chromosomes: 2n=16, 32, 48. Habit: Annual, roots fibrous, not clustered. Stem: erect, occasionally decumbent in coastal forms. Leaf: 0.8--7 cm, 1--6 mm wide, linear to oblanceolate, entire or with 3--5+ teeth, hairy. Inflorescence: involucre 5--10 mm, bell-shaped or hemispheric; phyllaries 4--13 in 1 series. Ray Flower: 6--13; ray 5--10 mm. Disk Flower: anther tip triangular. Fruit: < 3 mm, black to gray, glabrous or hairy; pappus of 1--7 clear, brown, linear to awl-like, awn-tipped scales, or 0. Chromosomes: 2n=16,32,48. Ecology: Many habitats; Elevation: < 1500 m. Bioregional Distribution: NW (exc NCoRH), CaRF, SNF, GV, CW, SCo, WTR; Distribution Outside California: southwestern Oregon. Flowering Time: Feb--Jun Note: Circumscription previously included Lasthenia gracilis. Plants of Lasthenia californica subsp. californica and Lasthenia gracilis without pappus not distinguishable morphologically; molecular studies show them as separate and distinct taxa. Citation for this treatment: Raymund Chan & Robert Ornduff 2012, Lasthenia californica subsp. 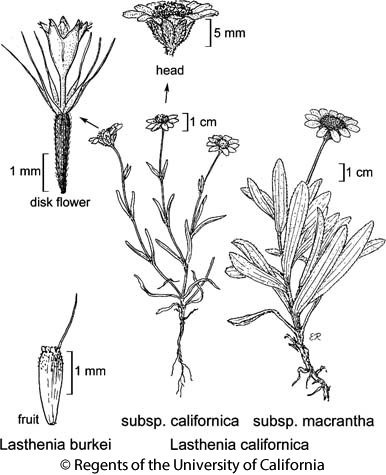 californica, in Jepson Flora Project (eds.) Jepson eFlora, http://ucjeps.berkeley.edu/eflora/eflora_display.php?tid=79084, accessed on April 24, 2019. NW (exc NCoRH), CaRF, SNF, GV, CW, SCo, WTR; Markers link to CCH specimen records. Yellow markers indicate records that may provide evidence for eFlora range revision or may have georeferencing or identification issues. Purple markers indicate specimens collected from a garden, greenhouse, or other non-wild location.